A Sunday ritual is evolving. Big G and I have a slow morning followed by a stroll around Milnerton Flea Market. While I’m making breakfast, Big G counts out coins from the loose change bowl. R100 each (about £7) to spend on whatever we wish. With our shrapnel lining our pockets we each have a in mind of treasures we’d like to find. Mine is vintage look china, crockery and props for the blog. Big G is on an eternal hunt for a pair of roller skates each so we can cruise down Sea Point. We’re yet to find them. We rummage through the tables and piles of other people’s junk (along with many other foragers) and so far have come away with some gems. When our search fails us we pick up a heavily reduced bottled of sun cream being sold at knock down prices. After we’ve finished we visit the Indian samosa stall for a freshly cooked spicy chicken samosa, buy a copy of The Sunday Times and contemplate where to head off to for coffee and cake. On this occasion our inspiration for Cape Town’s city hangouts failed us and before long we were heading out to Kalk Bay in Ruby (our beloved 1960’s VW Beetle). Balanced on the edge of the ocean, a tiny bohemian town on the road out towards Cape Point, Kalk Bay is admittedly a bit of a tourist trap but small enough not to draw in hoards and busy enough to create a nice bubbling murmur that envelops you. 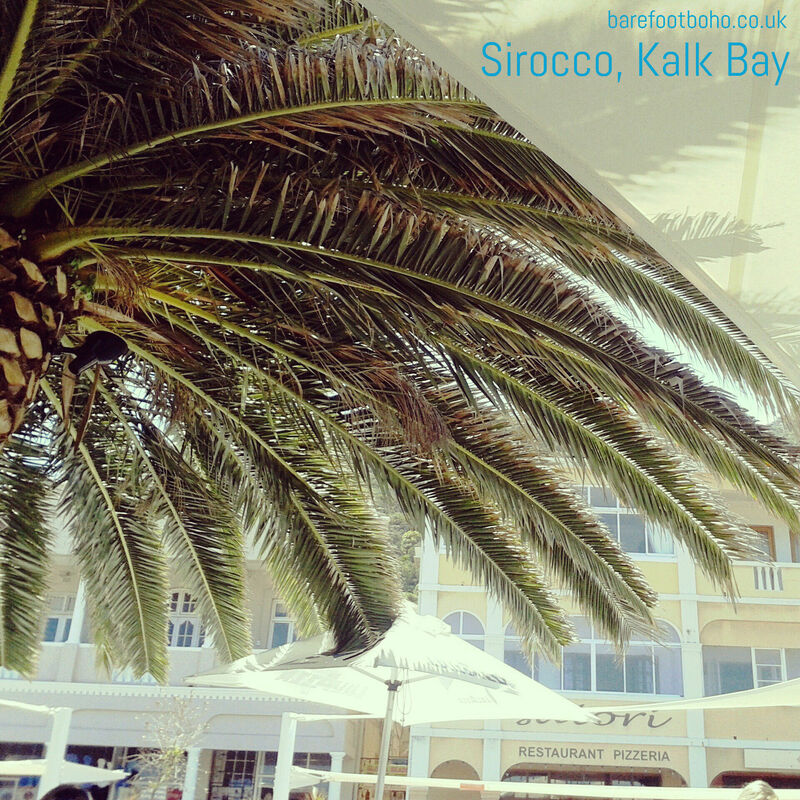 There’s a sweet spot on the main road, opposite the art galleries and boho shops, called Sirocco. An outdoor café wrapped around a weeping palm tree, where everything is white and gives a feeling you could step straight out onto a white sandy beach. They only open during the day, 8am to 4pm 7 days a week, but you wouldn’t go anywhere else to drink Lavazza coffee, lounge on the comfy bench seats strewn with scatter cushions, drink afternoon tea from delicate blue teapots, eat fabulous cakes or (as we did) slip into a lazy sunny lunch. Once a table was found (it’s worth hovering around for at the bar) we settled in, ordering some cold white wine, and distributed The Sunday Times supplements between us. Ok, so we came for coffee and cake but I can’t sit in a place of food worship without partaking in the menu in some way. 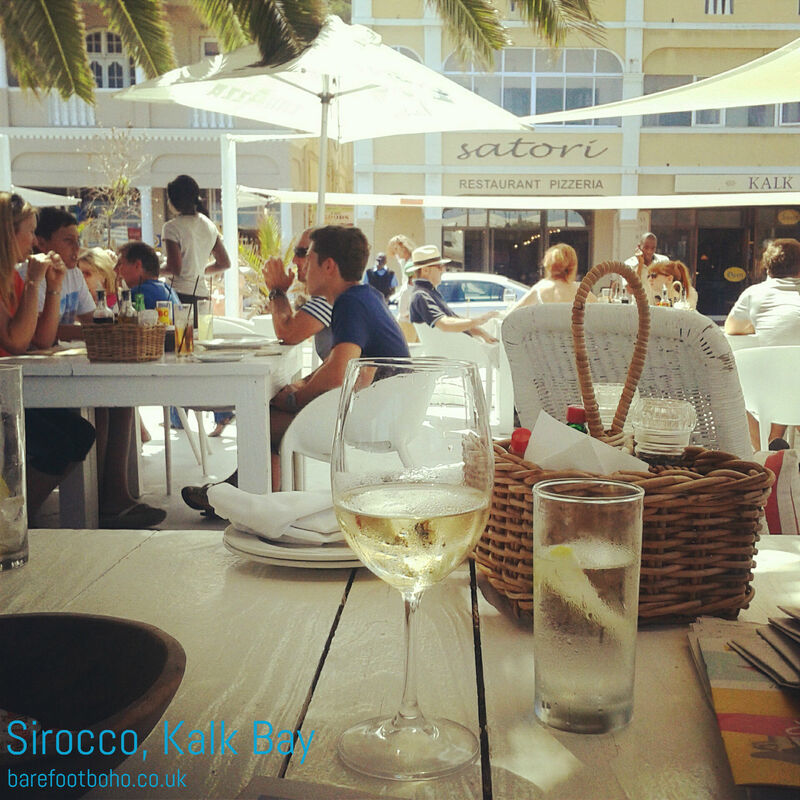 What arrives at our table are two seafood dishes which are perfectly light and summery for a hot lunch time sat under a palm tree by the Ocean on the Western Cape. No overpowering flavours. Just light, creamy dishes that let the seafood do their thing. Big G ordered Fresh Black West Coast Mussels R90. Steamed with white wine and cream, infused with garden thyme and garlic, served with fresh ciabatta. He could easily have eaten more and, usually happy to let me try what he orders, would not a single plump mussel make its way in my direction. Extra bread was ordered and the liquor mopped up. I chose the Seafood Pasta R85. 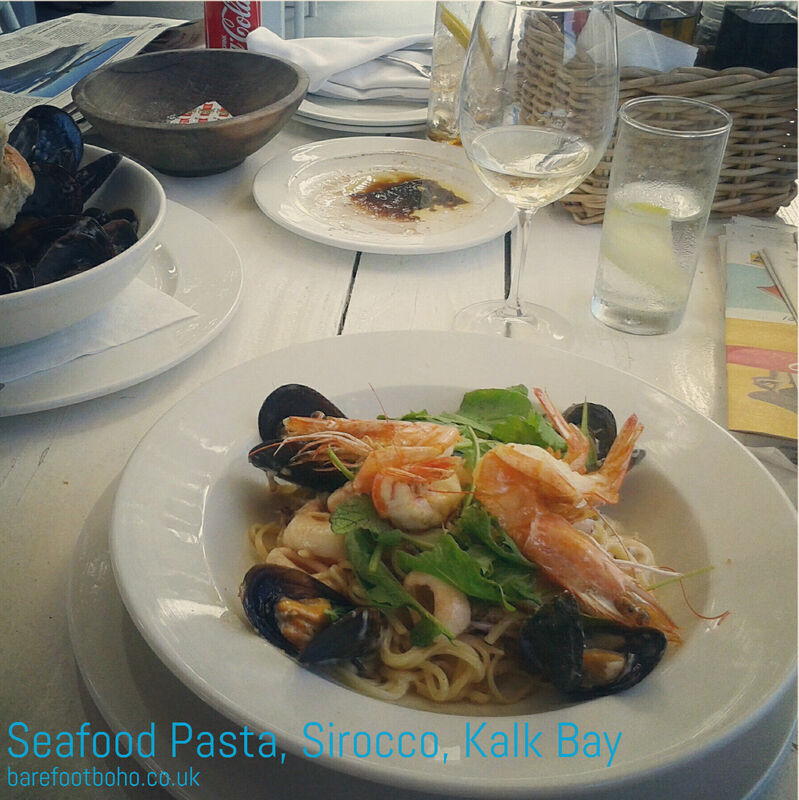 Linguine with prawns, mussels, calamari, linefish, rocket and Parmesan in a garlic and white wine sauce. Soft juicy mussels, generous butterflied prawns with plenty of meat to roll around in the linguine and creamy sauce, and an abundance of soft and tender calamari. I could have taken some more garlic but do you know what, on a hot Sunday, with a glass of wine on the table and I could have eaten it all afternoon. 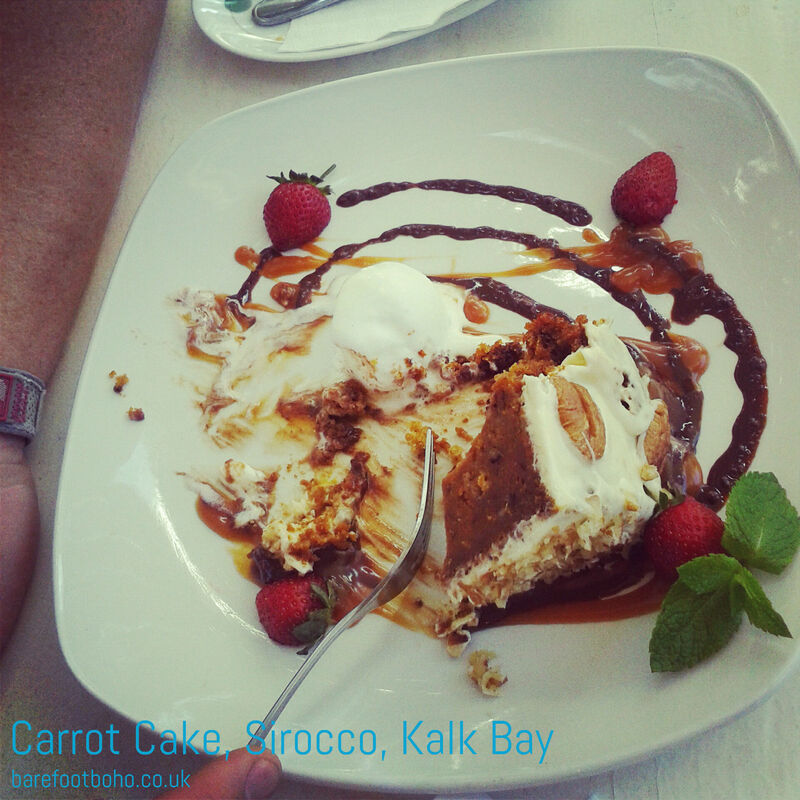 What we originally came in for however was this slice of sticky carrot cake laden with chocolate and caramel sauce. To have with our coffee, remember. What you can’t see is the second fork which snuck in, only a couple of times!